Over 25 years ago, I was invited to be in an exhibit that included a book entitled Art Quilts: Playing with a Deck of Cards. I quickly said yes, and was one of the 56 artists involved in this project. 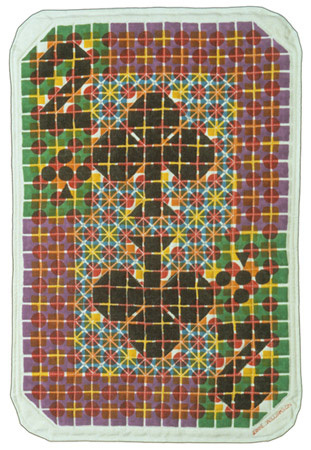 There are 52 playing cards and 2 Jokers, all made as art quilts. I created the Two of Clubs in 1994. This piece was created by hand stamping hand cut 1" rubber erasers with fabric paint on one piece of fabric. Because there was no piecing or applique, making it required full concentration, and it took a few tries before I made a perfectly stamped piece of fabric. While I'm still working with grids, my work has totally changed in the past 10-15 years. The show was organized by Sue Pierce, and was first exhibited in 1995 by the Smithsonian Institution Traveling Exhibition Services (SITES). I have very fond memories of attending the Opening Reception at the Renwick Gallery. An exhibit of Playing with a Deck is at the Visions Art Museum in San Diego, CA from today through Sunday, April 7, 2019.